Phew! 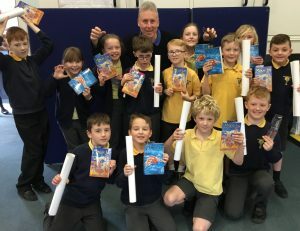 Kath and I made it to the Isle of Man to visit some of our favourite schools during World Book Week. The weather forecast was scary to say the least – almost as scary as my books! However, the ferry crossing from Birkenhead across to Douglas was the calmest crossing we’ve ever experienced. Maybe ‘the calm before the storm’ as they say! felt strange being at the school without our old friend, Mr Robinson, (he is now retired), but his successor (and not-so-old friend), Mrs Riley, proved the perfect hostess and ensured we were well looked after during our first morning. We’re planning to meet up with her at the weekend to explore a spooky place she wishes to show us on the island – maybe the setting for the next scary book! Well…at least we had ONE great visit during World Book Week…hope the snow doesn’t dump on us and stop us from visiting the rest! Great news…the snow stayed away for our second day and we made it to St John’s School, another favourite of ours. 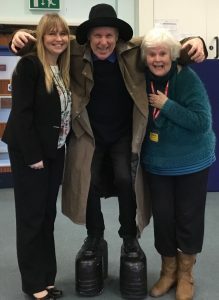 The Mokee Joe Finale presentation was performed all over again, and our second KS2 audience were completely captivated, joining in with great gusto as I changed into the seven-feet tall Mokee Joe and charged around the hall. One of our keenest fans, Harry, seemed to know more about my books than I did, and another young fan (Tough Ted) showed no fear whatsoever as I donned my huge Mokee Joe boots and towered above him. He gave me 0/10 for scariness! (I’m very upset about this!) Thank you to Mrs Willoughby and her lovely staff and pupils for giving us the usual fab welcome…we love visiting this school! See you tomorrow for the book-signing. Will we make it to our third school tomorrow (actually, two schools – Dhoon and Laxey)? Fingers crossed! WEDNESDAY: ALL ISLE OF MAN SCHOOLS CLOSED TODAY! I obviously didn’t cross my fingers hard enough! We will keep in touch with our friends at Dhoon and Laxey and hope the situation improves. Oh well…at least I can get on with writing my new book (a closely guarded secret!). in the UK and Thursday found us back in action at Bunscoill Rhumsaa. Years 3 and 4 turned out in amazing book character costumes and did the school proud. I was soon feeling at home amongst them dressed in my Mokee Joe outfit, complete with massive platform shoes to make me 7 feet tall! It was brilliant fun working with the younger end of KS2 and the morning passed only too quickly. 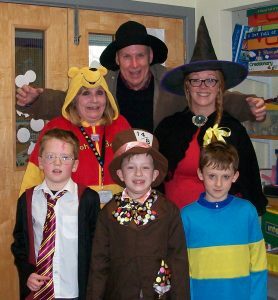 The following day we returned to enthuse and entertain the older pupils in upper KS2, and again, fabulous fun. The pupils at David Jenkin’s school always do us proud, they and the staff have become good friends and big fans over our years of visiting the island. Whilst the mainland back home struggled with the snow and cars got stranded on roads the length and breadth of the country, Kath and I spent a very stress-free Friday afternoon driving around island schools signing books for our fans. We have been extremely lucky in being on the IOM during the busiest week of an author’s year! Looking forward to visiting two more schools after a relaxing weekend. 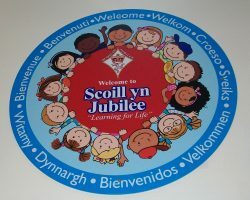 After an interesting weekend, including a failed ‘Wallaby Hunting’ expedition with our friend, Karen, and her husband, Rob, it was back to work with our very first visit to Scoill Yn Jubilee, in Douglas. We presented our Mokee Joe Finale performance to a large group of Years 5 and 6 and had a great time. 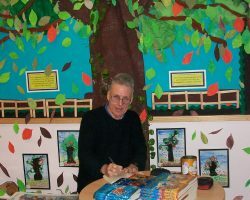 It’s a lovely school and it was fab to make new friends and recruit new fans for our books. The book signing the next day showed us just how many new fans we had made! 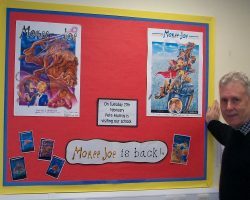 It was interesting during the signing how many passing Year 4’s expressed their frustration at not being involved in the presentation – we assured them that Mokee Joe would ‘get them’ next time! …And thank you to all schools on the brilliant Isle of Man for making our visit so enjoyable and successful, hopefully from both sides. It was nothing short of a miracle that we were able to go ahead with our World Book Week schedule. Had we been back home, much if not all it would have no doubt fallen foul of the severe weather! We will be back again soon, nothing so sure, and hopefully we might even spot a wallaby or two next time…who knows!